were reported from Vermillion County, Indiana, in October. necrotic foci in both lungs and involvement of the liver. Civilian .............................. 41 25 2.335 2,002 "
Chest X-ra) showed multinodular infiltrates in both lungs. and water samples from the picnic area are in progress. 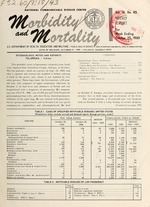 Health Reports 84(7):611-615, July 1969.
pers. J Infect Dis 117:393-402, December 1967.
husband was nauseated, i .i ., and dazed but did not vomit. found by the filling station operation. in front; 3000 ppm in back). ices; Carl Reynolds, Resident Inspector, Food and lDri,. Department; John R. Philp, M.D., Health Officer, and R. A.
who had been a member of the same safari group. On Oct.
agents to contact a physician at once. were made available to them. of this possible case of smallpox. stages of lesions maculess, papules, vesicles, and crusts). A healed vaccination scar was seen on his left shoulder. that this was not smallpox. 1 I the total, expected number, or cumulative total, until 5 years of data are collected. a; pll on( li \ ho ac(quirod the disease in Brazilt H'.l'. l 0l Vol. these have heen given since January 1967. Tomo 3, No. 25, Aug. 30, 1969. DIRECTOR. EPIDEMIOLOGY PROGRAM A. D. LANGMUIR, M.D. EDITOR pro fero ALAN R. HINMAN, M.O.